Hundreds of mourners leaving the funeral of a protester launched one of several spontaneous anti-government rallies in Sudan on Friday, as police said "only two" people had died in violence the day before. Organisers of the ongoing anti-government protests had said three protesters were killed on Thursday. Protests have rocked Sudan since December 19, when the government raised the price of bread. The rallies have escalated into broad demonstrations against President Omar al-Bashir's three-decade rule. Video footage showed the dead protester covered in a green shroud being carried to a cemetery, after which mourners marched through the area, witnesses said. Men and women, many wearing masks and shouting slogans against the government, walked through Burri as thick smoke billowed from burning tyres and rubbish. Protestors clapped, whistled and flashed the victory sign, while some carried Sudanese flags. Witnesses said a group of mourners had attacked a police vehicle before the funeral procession. "The police had to leave the vehicle and flee," a witness said, adding that some protesters climbed and stomped on the vehicle as others cheered. 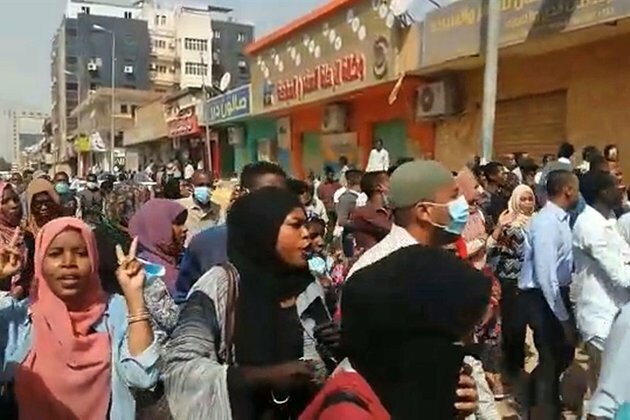 Later on Friday, protesters took to the streets again in three areas -- two in northern Khartoum's Bahari district and one in Omdurman, witnesses said, adding that riot police quickly confronted them. Hours later, residents of Burri staged a demonstration that led to clashes between riot police and protesters, witnesses said. The SPA later said another protester had also died during the day. But police spokesman General Hashim Abdelrahim told reporters Friday that "only two people died and not three. I insist that only two people died from their injuries." He added that security forces had fired tear gas at demonstrators and "not live ammunition". The doctors' committee said the child and medic were killed by "live ammunition" but did not specify who had fired the shots. It said other people had sustained bullet wounds. Angry mourners who had gone to the funeral of one of the victims rallied on their return from the cemetery on Friday, witnesses said. Sudanese officials earlier put the overall toll from the violence since protests broke out in December at 24. Rights group Amnesty International on Friday urged Sudan to halt its "ongoing deadly onslaught on protesters and medical personnel". Sarah Jackson, Amnesty's deputy director for East Africa, said Friday it was an "outrage that Sudanese security forces continue to use lethal force on protesters and key service providers like doctors". Amnesty, which has accused Sudanese security forces of using live bullets and teargas inside hospitals, last week said over 40 people have been killed in the unrest and more than 1,000 arrested. The tough government response has drawn international criticism, while Bashir has blamed the violence on unidentified "conspirators". Sudan's ambassador Omer Dahab Fadl Mohamed told the UN Security Council on Thursday that Khartoum was "fully committed to giving citizens a space to peacefully express their views".